That's your brain, that is. The adorable pink ball of whatever-he-is, Kirby, is coming back to DS for one last appearance with Kirby Mass Attack. Nintendo has just shot over a hot slice of video footage and some screenshots too, which you can find below. We played the game in July, so if you want to know more you can hurl yourself into our Kirby Mass Attack preview. Kirby reaches North America on 19th September. That certainly is not the size of my brain! Cool vid though! This looks good, but i will be focusing on my ambassidor games first. @Jake First comments aren't allowed here. Looks like a fun game though. Looks fun. A new twist on Kirby . I suspect this will be my last DS purchase. They should have put this on 3DS! Looks awesome, but. No more DS purchases for me anymore. This will be my last DS purchase. Then Nintendo can bring Kirby to the 3DS! Woah, the Sorcerer dude looks like Onix from Zelda Oracle of Seasons! Also, might be my last DS purchase too, but who knows...depends what games will come out. This game has a LOT of cameos from all around the Kirby series present in the AWESOME Sub games. Past Final bosses and such in an RPG Battle kind of game, Pinball and Shoot-Em Ups. The Sub games almost look better then the main game itself. Think this and prof layton spectre's will be my last 2 ds games. God that music was terribly annoying! But the game seems fun, like a cross between Docomodake, Yoshi Touch and Go, and Pikmin, with Kirby stuff thrown in. The first touch Kirby game was awesome, so this should be good. This, prof Layton, Solotorobo and maybe the aliens game made by Wayforward, will probably be my last ds games. at least that I buy new. I want this game so bad, but I think this game should be for Nintendo 3DS, we need a 3DS Kirby, Nintendo: then don't ask why 3DS sales are bad while you are still releasing DS games. Do an effort! I love you Nintendo, I love you! These pink puff balls are destructive, can't wait to pick this game up! I want this so bad... BUT I HAVE NO MONEY!!!! Why are wizards always casting spells on Kirby that change his form? Just like everyone else, this will probably be the swan song of my DS library. That, and The Last Specter. My only gripe is the music. It doesn't sound very Kirby-ish to me. Other than that, the gameplay looks crafty and imaginative. I do hope Europe won't have to wait too long for it to be released over here. Sorry, but I hate indirect control schemes. I won't be getting this anytime soon, even though I want to. I bought Cave Story and Donkey Kong instead. If Kirby had come out sooner, I might have bought it. This looks really really great! I wasn't too excited when I first heard about it but my excitement has definitely been building since then. It looks really creative and challenging! Plus it reminds me of Pikmin which is a VERY good thing Between this and Professor Layton it looks like the DS isn't quite dead yet! Awesome trailer! This will be much better then I expected! By the way: Do you guys think it takes place in a different world? Because sooo many enemies are new to the series. I don't think it takes place in Dreamland. I will be buying this one before both Kirby Wii and Starfox on the 3DS. It really looks interesting and fun. Plus I am intrigued about playing without any buttons. I've never been a huge Kirby fan but I think this looks great. Will be picking it up! Kirby, you are officially gaming biggest ! And this is the song my DS started to play when it saw this trailer. Gotta say, I can't wait though! I'm almost done with Pikmin 2 ( yeah, it really did take me this long to start playing it ) so another game in that vein of gameplay style may be fun while I'm still in the mood! 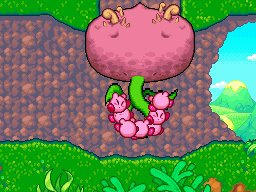 ....Wait, why wasn't this a Pikmin game? I'd pick this up at some later date but not the highest on my list. I'm getting ready for Kirby Wii personally. A Kirby party is definitely one I don't want to miss. I love the graphics for the game. It looks fun, I don't know when I am going to get it though. Looks like we have a Nightmare inspired villain but he actually looks more menacing than him I can only imagine how hard he will be. The editors at IGN had a hard time beating King Dedede in the beginning so its gonna be difficult and the absence of copy abilities leaves more to be desired tho I hope they at least decide to implement them in some form. We have 10 Kirbys here! Imagine if each one had a different power? This game would definitely be a mindf*ck if that were the case and it would certainly get intense.